The 7 Signs of Ageing, which is a popular term used by the Health industry as a simple set of features that you can look out for to monitor your skin’s health. However the same idea can be used as a great tool to evaluate the health and condition of your lawn. Your lawn can undergo a series of trials and challenges; from low light and weeds to being trampled on by kids and pets. This can result in worn areas and muddy patches, which can not only look unsightly but the additional mud can create more mess around your property. Ultimately kids can end up spreading muddy footprints on your carpets. Over time the state of your lawn can deteriorate and become a let down to the rest of your garden. If you notice any of the below symptoms it can be the early warning signs that your lawn is struggling under the pressure of low light and overuse. Healthy turf will form a neat uniform layer across your lawn which can put up a tough fight against heavy footfall. However if the rate of grass growth is less than the rate at which grass is lost then inevitably, after thinning, gaps will appear. If you purchase rolls of natural turf, you’ll notice that it is able to hold its shape, in a roll, very well. Even though essentially it is just soil and individual pieces of grass. Natural turf is able to do this because of the shape and the structure of the roots. The grass roots grow and become entangled holding the soil between the roots in place and supporting all of the surrounding roots. Once gaps in the grass appear, the supporting roots also disappear and this leads to the spread in the size of the gaps. If you first notice these initial gaps it would be a good idea to ask yourself why this is occurring. If the answer is because the grass can’t grow fast enough due to your lifestyle and the grass’s growing conditions, then we would recommend looking into Artificial Grass which is able to withstand heavier activity. One consideration of your lawn wearing down is that you can’t control the rate at which it wears away, and you can’t control exactly which areas will lose grass and soil and which areas will remain undisturbed. This can lead to slight shallow dips in the surface of the lawn which can appear anywhere. During episodes of heavy rainfall, the very first thing that will happen is that these areas will fill with water and ultimately puddles will appear. If the ground is saturated these will stay until they evaporate. You might not know this, but when you install Artificial Grass, the primary activity and the majority of the work, isn’t laying the grass. It’s the landscaping preparation work that is carried out, prior to even touching the Artificial Grass. Sometimes we add a layer of crushed stone to help with drainage but more often a layer of sharp sand will suffice. The most important part of laying the sharp sand is making sure it is level. Our teams of installers are experts in this area and will ensure a smooth, flat and level layer of Sharp Sand is in place before rolling out the Artificial Grass. Sharp Sand isn’t an immovable object, but under a layer of Artificial Grass, it would require a very unusual episode of heavy activity in order to change the surfaces shape and gradient. This symptom might not be so noticeable in the Great British weather. However, if we do experience a dry spell the moisture within the soil will evaporate and disperse. The structure of the roots in the grass can hold the grass together just enough to keep its general shape. When the rain falls again the soil will absorb the water and the natural grass will then use this water. However, if your lawn is in a poor state of health the grass roots will have a poor structure and in very dry weather the soil will crumble and become loose. During periods of extended dry weather, the crumbling soil will break up into ever smaller parts creating dust. During a drought, Artificial Grass will not only need any watering but it will produce zero levels of dust. Your lawn might look ok from afar and when it isn’t being used. But if the grass is unhealthy and slow growing then only a small amount of activity and use can result in it quickly being churned up and producing muddy areas. 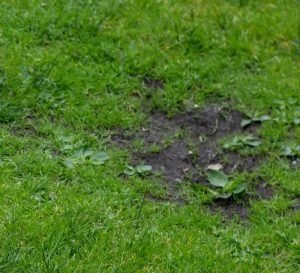 If your lawn looks fine but turns muddy after only a short time of children playing or dogs running on it, then it is probably a sign that the grass hasn’t grown much from the last time it was used heavily. Natural lawns will require weeding from time to time. It is essential that this weeding is always carried out promptly before the weeds have a chance to spread. Common weeds like Dandelions, Crabgrass and Smooth Brome can spread quickly on your lawn if they are not treated. It might sound obvious but weeds lead to more weeds, which lead to more weeds and if you don’t stay on top of them, they can become almost like an integral part of the lawn. If you are installing the Artificial Grass over existing soil, make sure you purchase our Weed Membrane. This is a layer that sits underneath the Artificial Grass and will simultaneously allow for seamless drainage whilst preventing any weeds from growing. 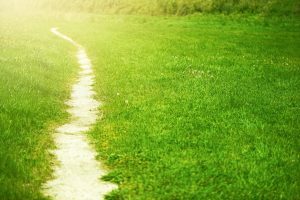 Have you ever wondered what the name for the small paths that people create through grassy areas are called? Well, it’s ‘Desire Lines’ which is an interesting concept as it’s the average path of all the individual walkers. These lines will often meander through the middle of a field, seeming to take a random to and fro in terms of direction, instead of a straight line. But a more obvious place you might find Desire Lines is at the entrance to a doorway or a gate. If you frequently enter your garden from the same location, small Desire Lines can start at these points. This is a sign that the grass is starting to wear away and it can eventually lead to unsightly patches on your lawn. Finally and most obviously is mud. 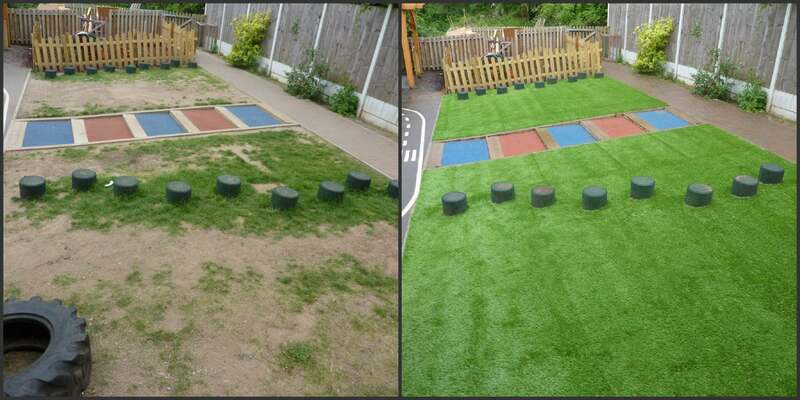 If you have muddy areas on your lawn then Artificial Grass can be a solution and eliminate the problem. Kids love to play in the great outdoors and dogs love to burn their energy by running around, and garden owners shouldn’t inhibit their playful attitude. Instead of trying to prevent mud by limiting the use of your lawn, prevent mud with Artificial Grass. If you notice any of the above signs on your lawn, it could mean that you are wearing your lawn away faster than the grass can grow. Poor quality soil, not enough light, too many weeds and high levels of activity can lead to an unhealthy, unsightly lawn. Artificial Grass requires no weeding, no sunlight and can withstand very high levels of activity. If you’re interested in Artificial Grass, call our friendly team today on 0800 587 0380. We will be happy to offer any advice.